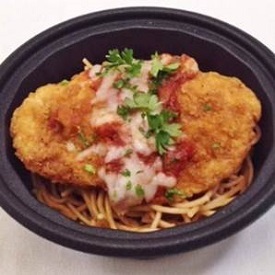 Hot chicken parmesan and spaghetti recipe with fresh Italian flavors developed by the California Culinary Centers for school food service menu planning. This recipe yields 4 gallons spaghetti and sauce plus 13 pounds and 10 ounces of breaded chicken fillets for 50 servings: 1¼ cup of spaghetti with sauce and 4.35 ounce breaded chicken fillet. Preheat oven to 375°F for conventional oven or 350°F for convection oven. Boil 10 gallons of water in tilt skillet. Cook spaghetti until al dente. Heat spaghetti sauce in 8 quart pan over medium heat. Place baking pan liner on two–12 inch by 20 inch by 2 inch baking pans. Place frozen chicken fillets on pans. Bake uncovered for 10 to 12 minutes or until internal temperature reaches 165°F for 15 seconds. Critical Control Point (CCP): Cook chicken until internal temperature reaches 165°F for 15 seconds. Drain spaghetti in colander to measure 3 gallons and 2 cups. Toss spaghetti pasta with spaghetti sauce. Use 1 gallon, 1 quart, and 1⅞ cups of spaghetti sauce. Set aside remaining 1 quart of sauce for assembly. Place 1 cup or number 4 scoop of spaghetti and sauce mixture in 16 ounce microwave safe bowl. Place one chicken fillet on top of spaghetti and sauce. Scoop 1 tablespoon spaghetti sauce on top of chicken. Sprinkle 2 tablespoons cheese on top of spaghetti sauce. Chop parsley to yield 1 cup and 2 tablespoons. Sprinkle 1 teaspoon parsley on top of dish. Cover and keep in warmer. CCP: Hold chicken pasta parmesan at 135°F or higher for service. Serve one–16 ounce individual serving. This recipe yields 7 gallons and 3 quarts spaghetti and sauce plus 27 pounds and 3 ounces of breaded chicken fillets for 100 servings: 1¼ cup of spaghetti with sauce and 4.35 ounce breaded chicken fillet. Boil 20 gallons of water in tilt skillet. Cook spaghetti until al dente. Heat spaghetti sauce in 16 quart pan over medium heat. Place baking pan liner on four–12 inch by 20 inch by 2 inch baking pans. Drain spaghetti in colander to measure 6 gallons, 1 quart, and 2 cups. Toss spaghetti pasta with spaghetti sauce. Use 2 gallons, 2 quarts, and 3¾ cups of spaghetti sauce. Set aside remaining 2 quarts of sauce for assembly. Preparation to serve time: 1 hour for 50 servings and 1 hour 25 minutes for 100 servings. CCP: Cook chicken until internal temperature reaches 165°F for 15 seconds. CCP: Hold chicken pasta parmesan at 135°F or higher for service.